Pie, the Pope, and probably lots of Pasta. It doesn’t get much better than that! She just told us you are in Rome! At hotel Alimandu Tunisi just outside theVatican until October 23! It’s a great article of hope! Very uplifting! Sounds like a great trip. Be safe, enjoy. I will enjoy the trip vicariously through this blog. I can only imagine how cool it must be to be in Rome and to see, even from the sardine section, Papa Francisco. Safe and blessed travels! Abigail, Shane and baby John are in Rome this week. Maybe you will run into them on the streets of Rome. Hope you have a wonderful visit. Just called their hotel. Did not reach. Will try again later. As God desires. May my desire be God’s desire. Rather, may my desire be what God desires, whatever God desires. That sounds holy, but is VERY hard for. Fr. 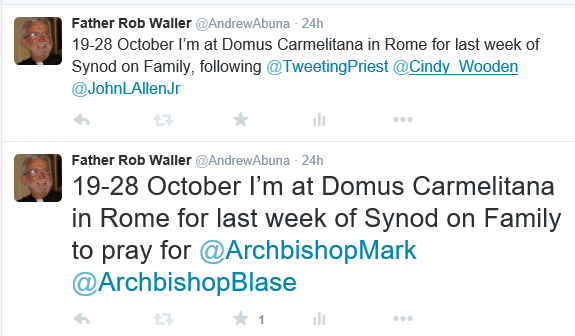 Rob, sounds like you are having a blessed trip in Rome! How wonderful! I am not sure if you have heard, but Nate is currently at the U.S. Navy Boot Camp in Great Lakes, IL. He had about 6 more weeks there and then 2 years of training for the nuclear program so that he will be qualified to work on the nuclear power aspects of an aircraft carrier. I was wondering if you would like to write him a letter of support to him. If so, please let me know and I will send you his address. They cannot have cell phones or email or computers for non-Navy activity. He probably would not be able write back but I know he’d appreciate the encouragement and prayers! Hope you are enjoying your transition to retired life.